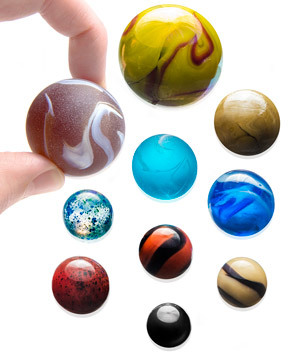 Solar System Marble Set: Collectible set of solar objects formed in glass. Ignite an awe for outer space and share the wonders of the universe with the Solar System Marble Set. This collection of glass spheres vary in size and coloration to represent ten major celestial objects in the Solar System: the Sun, Mercury, Venus, Earth, Mars, Jupiter, Saturn, Uranus, Neptune, and the dwarf planet Pluto. The set also includes ten display rings so your petite planets won’t roll off a display shelf. 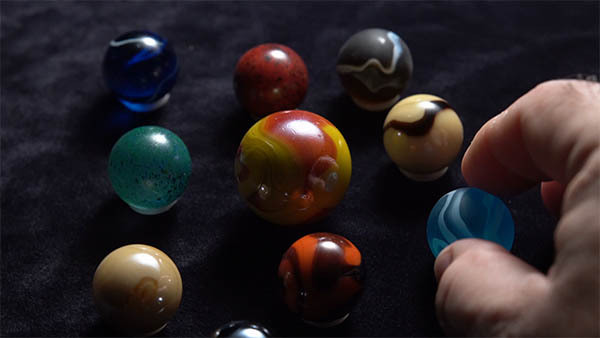 The Solar System Marble Set shrinks planets down to a size you can hold. Made from tough glass spheres, the planetary set lets everyone experience the universe in a new way. Since they’re small enough to pinch between your fingers, you can demonstrate the orbits of the planets just as easily as you can play for keepsies. 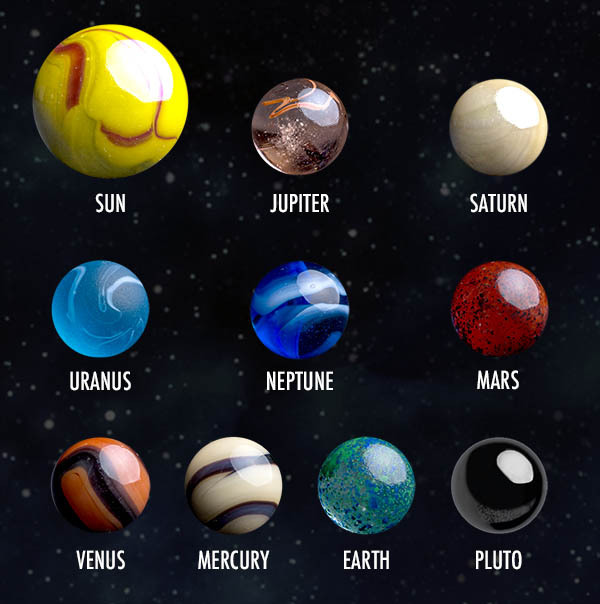 When viewed from a telescope, the planets of our Solar System have been described as beautiful little marbles. And now, they actually are! Each astronomical object is represented as a glass sphere with a unique size and striking swirling pigment. The stunning planet’s or star’s paint job impresses without having to use a telescope. Enjoy these works of art-stronomy. The Solar System Marble Set includes ten glass spheres, each representing a significant Solar object: the Sun, Mercury, Venus, Earth, Mars, Jupiter, Saturn, Uranus, Neptune, and the dwarf planet Pluto. Technically, the set also includes the current representation of Planet X. Question: Why did you include Pluto? Answer: We didn’t make the marble set, but it isn’t specifically a planet set (it also includes the Sun). Pluto is a popular dwarf planet that’s still an important object in the Solar System and also has historical significance, previously being recognized as a planet. Question: Is it scientifically accurate? 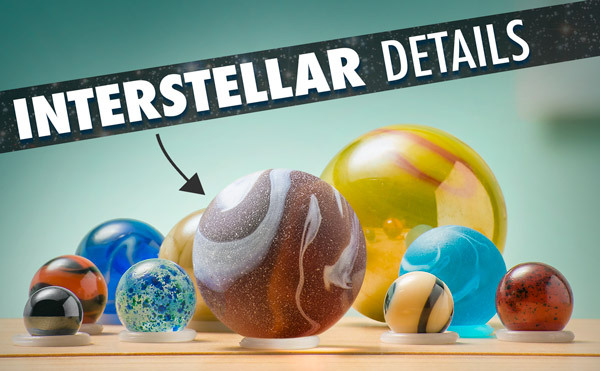 Answer: Each marble is a rough likeness of the astronomical object it represents, but the marbles are not to scale relative with one another as that would require a sun "marble" with a diameter 109 times larger than that of the Earth marble. Woah!